UNO Art Gallery’s current exhibit, Harry Duncan as Letterpress Mentor, celebrates an artisan movement that applauds the handmade, limited productions of local artists using a process and an aesthetic that hearken to times bygone. 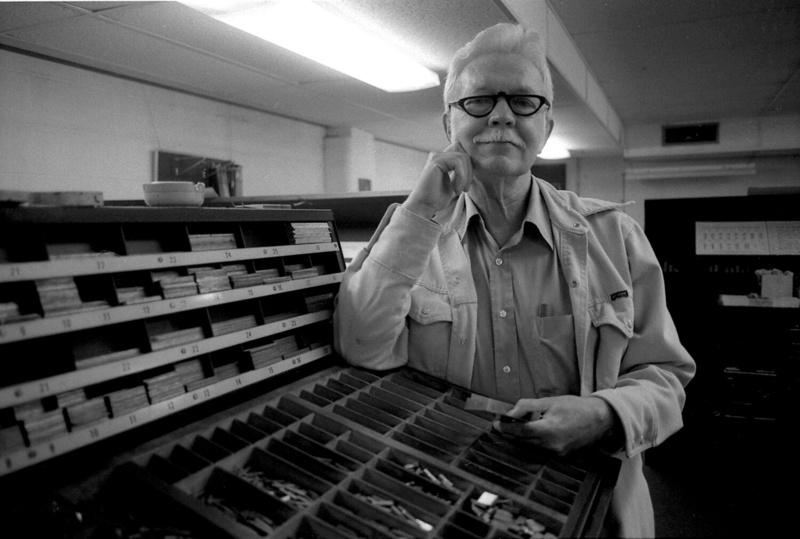 On exhibit until Feb.11 both at the UNO Art Gallery and the Criss Library, the show honors Harry Duncan, poet, letterpress publisher, and former UNO book arts professor on the anniversary of his 100th birthday. Writers, poets, graphic artists, illustrators and book lovers of all kinds, this show’s for you. In conjunction with the exhibit, Michael Peich will give a lecture, “Aldus in Omaha,” scheduled on Thursday, Jan. 21, at 7 p.m., in the UNO Criss Library. Peich, a poet as well as letterpress publisher of Aralia Press in West Chester, Pennsylvania, will discuss Duncan’s classical letterpress typography. Visitors to the lecture should be sure to see the exhibit of Duncan’s former students located in the library’s Osborne Family Gallery. Some may recognize early works of area artists among the exhibitors including painters John Miller, Marie J. Christian, and Gary Schmitz as well as Ozzie Nogg, writer and public relations professional. David Shrader, printer of one of the exhibited books, is the former Dean of the College of Fine Arts from 1982-1992, under whose tenure the Weber Fine Arts Building was built. Concentrated in the UNO Art Gallery are the works of Duncan’s previous colleagues, students and apprentices, some of whom are still actively involved in letterpress publishing. One of the galleries is dedicated to Juan Pasco, Duncan’s apprentice at Cummington Press in West Branch, Iowa, in the early ’70’s. Pasco is currently the owner and original founder of Taller Martin Pescador, a highly awarded hand-printer in Mexico. He has collaborated with writers Octavio Paz and Gabriel Garcia Marquez and other well-known Latino authors. The exhibit has over fifty pieces, but the standout is an exquisite single edition, folio-sized memoir by Marquez, with multiple foldout illustrations. Touching it induces reverence. Pasco’s style of layout and typography reminds one of biblical text illustrations of the old St. James Bible. A twelve-minute video filmed at his studio in Mexico explains some of the how, but mostly the why of his dedication to the art. Just a tip: start with the video as an introduction to the show. One will catch the sense of love that Pasco and other letterpress devotees have for their craft. It’s in Spanish, but don’t worry, UNO Art History student, Alma Becerril Salas, has subtitled it for the public. Beyond Pasco, the show includes work from other private letterpress publishers. As a tribute to Harry Duncan, Guy Duncan founded Gibraltar Editions with partner Denise Brady, Coordinator of the UNO Art Gallery and curator of this extensive exhibit. Others include K.K. Merker, Kay Amert, Doyle Moore, Allan Kornblum, and Neil Shaver. Karen Kunc, a printmaker from Lincoln, also has a number of pieces in the show. Another project, “All Along the Fence,” which Denise Brady sparked by asking for letterpress printings of poems from different students of Harry’s, hangs in the octagon gallery. Seventeen very unique printings were collected into an unbound portfolio of poems issued by Gibraltar Editions, which Brady organized and edited in tribute to Harry’s work. The letterpress artisans’ attempts to match the feeling and form of the author’s written message through choices in font, paper, and layout only occasionally missed the mark. A poetry reading presented by members of the “All Along the Fence Project” and a letterpress roundtable of exhibit participants is scheduled for Thursday, Jan. 28, at 7 p.m., in the Art Gallery. Also displayed in the octagon gallery are examples of Duncan’s publications, along with original print blocks of illustrators, including a small, intricate woodcut used to print a multi-colored illustration in an original edition. Thankfully, Duncan’s books and artifacts have been preserved in the studios of The Fine Arts Press, a letterpress teaching laboratory currently under the direction of Bonnie O’Connell, Book Arts instructor at UNO. Duncan, once referred to in Newsweek magazine as the “father of the post-World War II private-press movement,” through his mentorship has created a wide sphere of influence on apprentices, colleagues and students. In an artisan kind of way, everything old is new again. Visitors to the gallery should chat with Denise Brady, UNO Art Gallery Coordinator, as her knowledge of letterpress printing and of Harry Duncan will offer insights into the work on display. Note, that when planning a visit to the gallery and library exhibits, the UNO Gallery is open Mon-Thur 10 a.m.-3 p.m. The gallery is located on the first floor of the Weber Art Building near the north entrance. It is closed on holidays and during academic breaks. Appointments at other times are encouraged. Call 402-554-2796. Parking is available in the west lot for visitors. Press the call button on the gate meter and someone from the Welcome Center will raise the gate. Henry Duncan as Letterpress Mentor continues until Feb. 11, 2016 at both UNO’s Art Gallery and Criss Library. For more show details and hours go to http://library.unomhah.edu//infromation/hours.php.